Use our resources to learn more about monsoons. 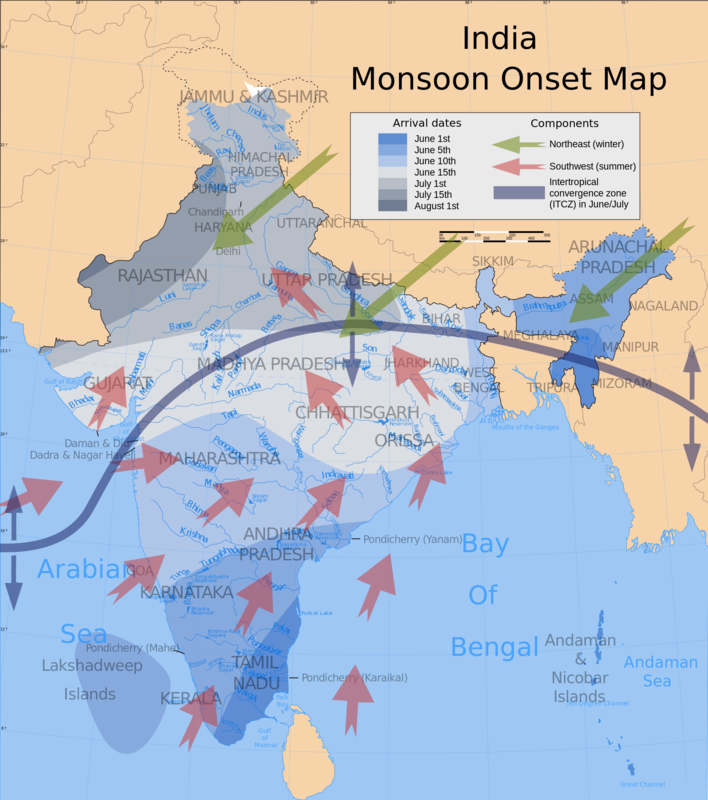 This dazzling map outlines the “true finance minister of India”—the seasonal monsoon winds. Map by Saravask, based on work by Planemad and Nichalp, courtesy Wikimedia. This file is licensed under the Creative Commons Attribution-Share Alike 3.0 Unported license. Read through our encyclopedic entry on monsoons. According to our entry, monsoons always blow from cooler to warmer regions. Where are the winds of southern Asia’s devastating monsoon coming from? Summer monsoons blow northeast, from the warm, humid waters of the southwest Indian Ocean, Bay of Bengal, and Arabian Sea. Although the Indian Ocean is warm, summer on the Indian Subcontinent is warmer—the land of the Indian Subcontinent heats more quickly than the ocean, so the wind blows from the cooler ocean to the warmer continent. Indian Ocean winds do not blow directly to Kashmir, the affected area in northwest India and northeast Pakistan, however. The moist winds first blow through central India, then make their way to mountainous Kashmir. How are the summer monsoon winds different from winter monsoons? What is the region of cooler temperature that drives the winter winds? Do you think Kashmir is at risk from winter monsoon winds? Winter monsoons blow southwest, from the freezing Himalayas and the Tibetan Plateau. Kashmir is on the western edge of the Himalayas and at risk during the winter monsoon’s brutal, cold winds. These winds do not usually cause the widespread damage that is associated with summer monsoons, as winter monsoons are not nearly as moisture-laden and do not bring as much rain. Read our activities to understand the threat the winter monsoons poses to mountaineers, however. The monsoons have regularly caused widespread damage in India, Pakistan, and Bangladesh for centuries. Yet the arrival of the winds are often celebrated. The summer monsoon has even been nicknamed “India’s true finance minister.” Why? The summer monsoon brings vital rainfall to the subcontinent. These rains support India’s enormous agricultural industry; fills aquifers that store water for drinking, industry, and hygiene; and fills hydroelectric dams that provide electricity to thousands.